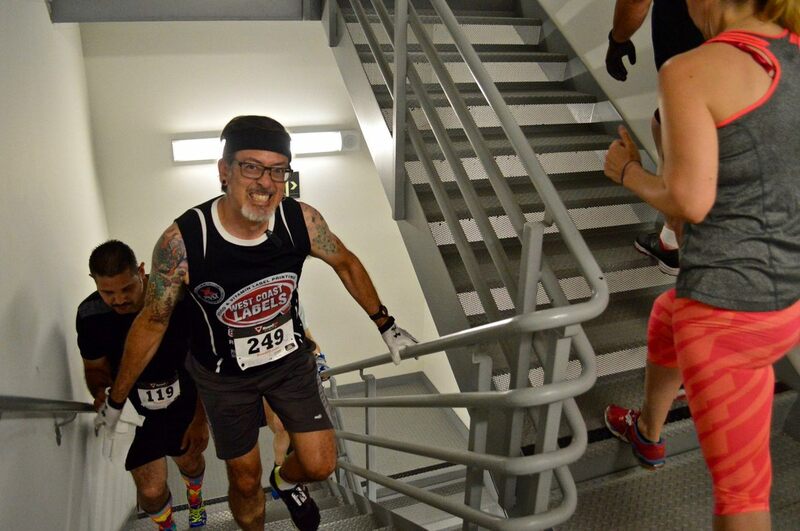 Today was the 2016 edition of the San Diego Towerthon. 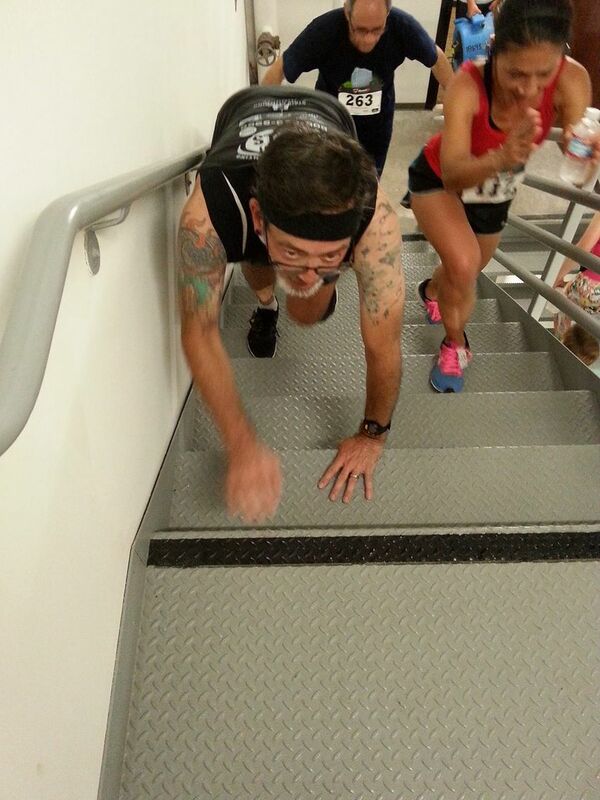 This is perhaps the single hardest stair-climbing race I’ve ever done, and also probably my favorite. 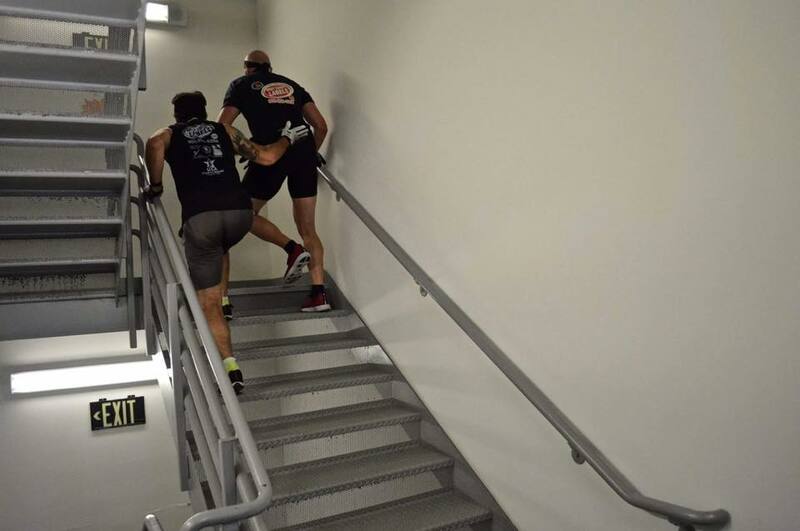 It’s 422 steps, 239 feet, 72.9 meters from the lobby to the 20th floor. And we climb it over and over and over and over for two hours. This is my fifth time doing this event. Last year, I only managed to do 19 climbs. The year before, I did 20. The two years before that were in a different building, so they aren’t easily compared. But the 2012 event was the origin of the Vertical Mile as a thing. In this building, 22 climbs is a vertical mile, but I’m not in good enough shape for that right now, although I did manage to do a two-hour vertical mile in practice at the Aon building in 2013. This time, I started off at my regular ‘easy’ pace. 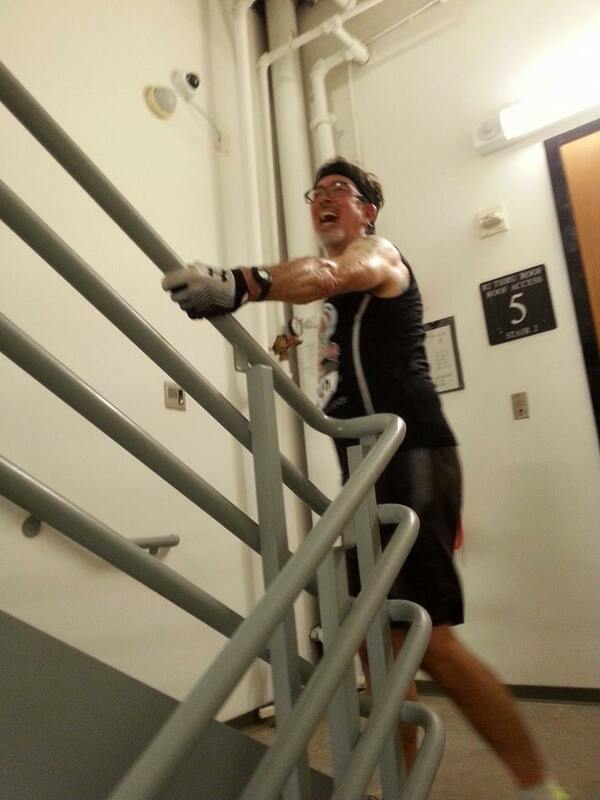 I was aiming to climb the building in a bit over four minutes each time. And I managed to stick to that pace for quite a long time. There were some problems with the elevator shuttle back to the lobby at first. For a time, there was only one elevator running, and we ended up having to wait for several minutes at a time at the top. But after about a half-hour or so, they got the elevators working, and also the herd thinned out a bit. I had some water and Gatorade on the table in the lobby, and I stopped to tank up about every 15 minutes. At the one-hour mark, I stopped long enough to change to a dry headband. It wasn’t until about 90 minutes in that I really started to slow down. 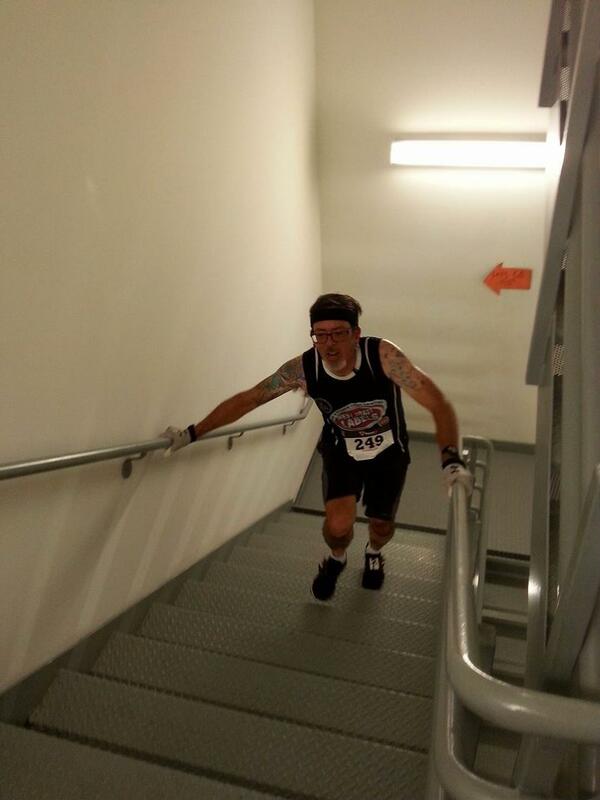 I kept a watch on the time, and I made it in to the stairs for my final climb at about 1:57 on the clock. So I knew that the last climb would count for my total, and that it really didn’t matter how long the last one took. Still, I managed to eke out a little burst of speed for the last three floors, just because I knew that I could stop when I got to 20. Sadly, I didn’t get a lot of pictures this time. There were a few that other people took near the start, and Jeff showed up about halfway through. He wasn’t racing, owing to having been sick. But he was able to get some pictures for me on the last few climbs. In the end, I managed 19 climbs, which was the same as last year. I think I’m slightly stronger this year, though. If we hadn’t lost those minutes waiting for the elevators at the start, I think I could have easily done 20 climbs this time. Still, I can’t complain. After all, my 19 is the same as the 19 George did, and he’s generally in better condition than I am these days. So all around, it was a good time. That photo of you giving Dan(?) a push should be used far & wide to promote this activity–it’s a classic! Thank you so much for the pushes you gave me! They felt great & really boosted my morale! My endurance climbs just ain’t what they used to be. Those old Aon sessions were the best! Thanks for the memories! 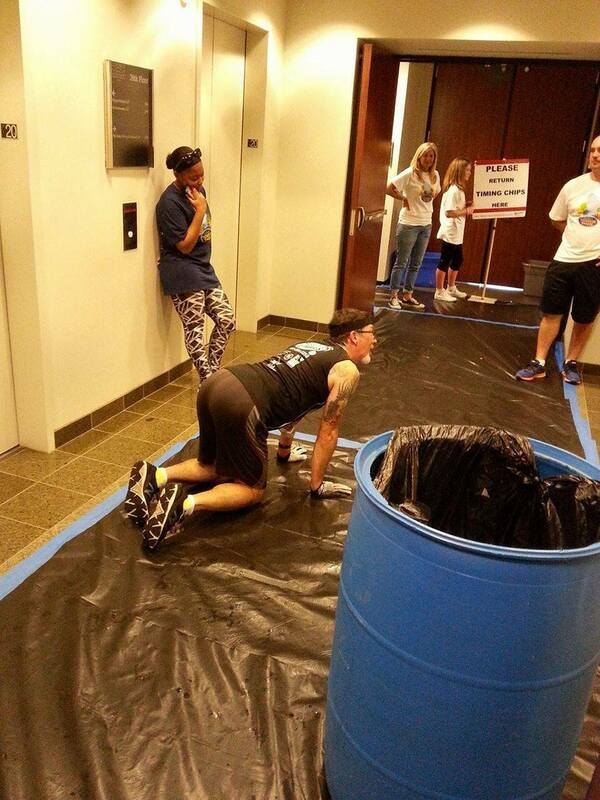 And yes, the Towerthon elevators were a real bummer this year, considering the bldg. personnel had a whole year to fix & test them after last year’s disaster. Even though they limited rides to 10 people, I still managed to get stuck with Josh & 8 other people for about 5 minutes. Scott was one of the first to get stuck for over 40 minutes. Ugh! But all in all, it was a fun day just to see everyone struggle & put forth their best effort. Have a great summer, & I look forward to seeing you at the YMCA training sessions!